Hi, I am Alina Freire Fierro. I am a botanist from Ecuador. I am originally from a small mountain village called Colonia Azuay in Tungurahua province, but grew up primarily in Baños, Tungurahua, on the slopes of Volcan Tungurahua which has been active since 1999. I and my family later moved to Quito, the capital of Ecuador. 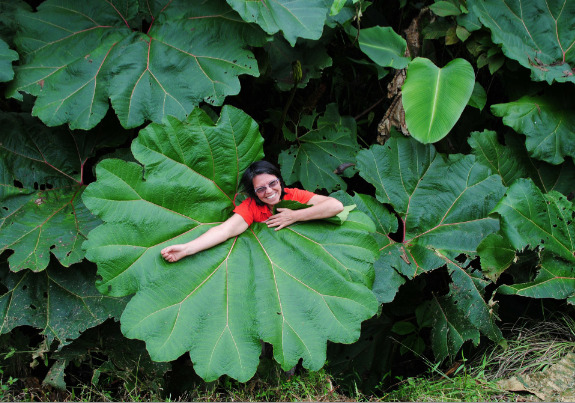 From 1998 to 2000 I was a researcher at the National Herbarium in Quito, Ecuador (where I lived until 2000) and have taught General Botany and Flora of Ecuador for Ecotourism majors at Catholic University and Systematic Botany at Universidad San Francisco de Quito. During 1999 to 2001 I was Directora Ejecutiva of the Ecuadorian Foundation of Botany, a professional organization of botany in Ecuador. During this period, FUNBOTANICA and the Ecuadorian National Herbarium organized the III Ecuadorian Botanical Congress held in October of 2000 in Quito. Dr. David Neill , former Curator at the Missouri Botanical Garden and former Honorary Director of the National Herbarium and I published in 2002 the Proceedings of the congress. From 2006 to August 2015, I lived in Philadelphia, where I worked as the Collection Manager of Botany at the Academy of Natural Sciences. While in Philly, I also obtained my PhD at Drexel University under the supervision of a wonderful mentor and friend, Dr. Walter Bien. I was also an Adjunct Professor of Botany at Philadelphia University for the Spring 2015 term. For the period 2015-2018, I was the President of the Asociacion Latinoamericana de Botanica-ALB and of the last XII Latin American Congress, held in Quito, Ecuador in October, 21-28, 2018. Since 2018, I am living in Latacunga, Ecuador working at Universidad Tecnica de Cotopaxi , where I am the Curator of the Applied Botany Herbarium UTCEC and professor of Flora of Ecuador in the Tourism Department-CAREN. In addition to working with plants, I learn a lot about insects from my favorite entomologist and partner Mike Huben. During my free time I moderate the discussion groups Anuncios Botanicos, and Botanicos Ecuador . For a “healthy mind in a healthy body”, I train Shinto Muso-ryu Jo (Okuiri-Sho), Muay Thai Kickboxing, and Krav Maga (Level II). I have also trained Aikido in Ecuador, Brazil, St. Louis, Missouri and Philadelphia.